s the goal of my President’s Winter Fellowship project: to place myself in a foreign environment with limited verbal communication skills in order to see if movement alone can communicate, and also to see where the areas of movement and speech intersect to form the bonds that create a community. 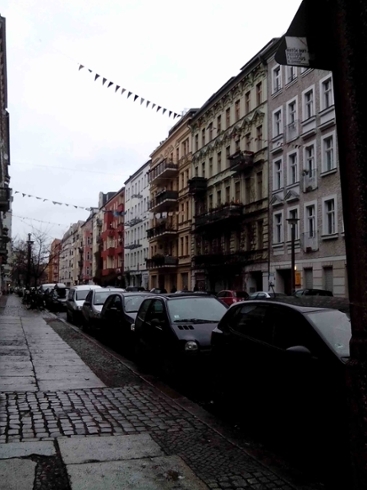 A community did form for me in Berlin. Arguably it was already waiting for me before I arrived, simply because of the dancing I have done in Portland. I discovered how the blues community has a global reach—doors opened for me because of my status as a blues dancer, regardless one from half way around the world. I got invited to a house party for New Year’s Eve. Laura, a Berlin blueser, hosted blues dancers in home. People brought food and drinks, the furniture was cleared away from her flatmate’s room to make space for dancing, and music was played off of a laptop set on the edge of the bed. I could not believe how personal and cozy it was. I felt instantly welcomed, and I had never even met Laura before that night. She welcomed me, a complete stranger, into her home simply because we shared common movement knowledge—and I was not the only one. Two dancers were visiting from Toronto, one was originally from Israel, and one came from Hamburg but hadn’t started blues dancing until she was in the U.K. for university. Blues dancing was the one thing we all had in common, a type of communication that we all shared even though we came from diverse backgrounds and experiences. The blues dance network reaches across the world, and through it I was able to immediately find a sense of home. At the same time, though, it is incredibly local. I was surprised by the tight connection of the community. 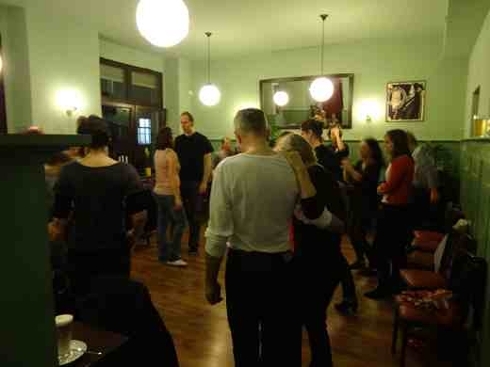 Social dancing builds community in a unique way: the sense of community is not tied to a specific venue but rather to the act of dancing itself. This lack of specific geographic stability gives the sense that the blues and swing community permeates the entire city—I knew that whatever dance venue I went to in Berlin I would see at least two or three people that I had met on the previous night. The dancers travel to where the dancing is, and wherever there was dancing there would inevitably be a familiar face. I was also surprised by how quickly faces became familiar during my time in Berlin. I met so many dancers in Berlin with whom I really connected. Our movement styles synced up, and there was a mutual excitement and interest: both of us genuinely enjoyed the other’s dancing and sought out the other as a dance partners at every venue. When I walked into a venue that I had never been to before, feeling a little lost and nervous because everything was new, it would be incredibly reassuring to see other dancers that I recognized, see their faces light up, and hear them say “oh good, you’re here! I want to dance with you!” This is the magic of the social dance community: positive affirmation on an individual level that creates the sense of a larger network. The sense of the larger blues community is created by establishing personal and intimate bonds with each of the individual dancers. A myriad of personal bonds paradoxically creates a group bond—the individuals create the community. And this type of community, these individual bonds, are inherent to the act of dancing and the movement itself. Edward T. Hall, a body language anthropologist, says in his book The Hidden Dimension that when people enter each other’s personal space, when “thermal spheres overlap and people also smell each other, they are not only much more involved but… they may even be under the chemical influence of each other’s emotions” (Hall 55). Close physical contact creates not only a sense of physical intimacy but an emotional one as well. Touch bonds us together, arguably much faster and much more personally that other types of communication. I learned so much about myself and about why I dance during my time in Berlin. Blues dancing is still a mystical experience for me, but now I better understand why I am so drawn to the form, why it creates such a sense of freedom, expression, comfort, and community. What I have learned about building community, and especially about the way in which dance helps build community, is the knowledge I am most excited to integrate into my life, however. Last summer I taught dance to children at a summer camp, and this year I am one of the signators for Reed’s student organized Dance Troupe. Both of these experiences have placed me in positions of leadership within movement communities. I want to create environments for these communities in which people feel comfortable expressing themselves through movement, even though our culture often builds up shame and anxiety around the dancing body. How is it that I make the community a safe space? This trip has taught me to conceive of the group as a body of individuals, and that the key is to connect personally with each individual and allow individuals to connect with each other through movement. This turns the movement more into a conversation than a performance, and turns the attention toward communication and away from judgment. With this knowledge I do not merely have to search for dance communities beyond Reed—I can create them myself, I can be the facilitator of safe movement spaces, no matter where I am or what direction my career takes me.